Erik Morales vs Danny Garcia is the fight we're most looking forward to tonight, with the possible exception of Zab Judah vs Vernon Paris. Just look at the bout on paper - five time world champion and Mexican hero takes on unbeaten American wonderkid. The fight has everything, and until recently there was a world title at stake for both men. Now, only Danny Garcia is fighting for the WBC light welterweight title. Morales, 35, weighed in at 142 Lb for the bout, two pounds over the 140 weight limit. According to sanctioning body rules this means he can still fight, but he cannot retain his world title. 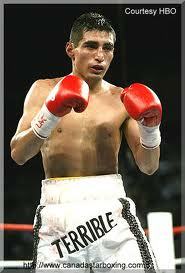 Danny Garcia can still be champion, and if he beats Morales he will be lifting the belt above his head. If Morales wins, the belt is vacant. At his age, Morales is obviously finding light welterweight a struggle. He could move up to welterweight, but just look at the competition there - Manny Pacquiao, Floyd Mayweather, Victor Ortiz, Andre Berto. Morales would find it a struggle against these guys, and retirement must be a possibility for the Mexican warrior. Despite the suspense of a title being taken away, this is still a compelling match-up. I have Erik Morales to win by UD, but I know a few are saying Danny Garcia will break through into the mainstream tonight. Who do you think will win?